Uber Reaches Settlement With Family Of Arizona Woman Killed By Driverless Car : The Two-Way An attorney representing the daughter and husband of 49-year-old Elaine Herzberg says a settlement with the ride-hailing company has been reached, but provided no specifics. 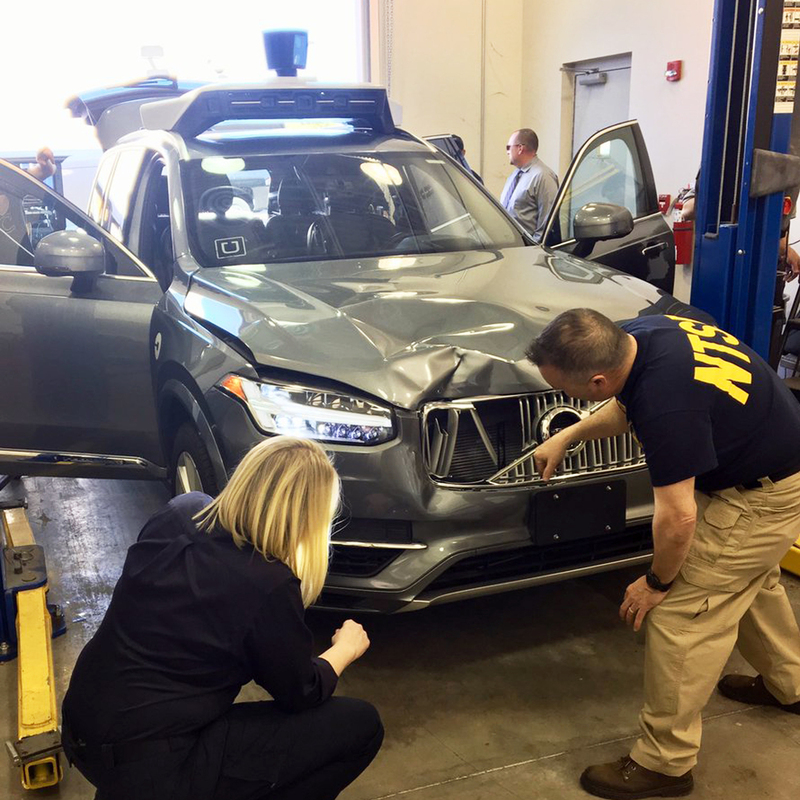 A photo provided by the National Transportation Safety Board shows investigators examining the self-driving Uber SUV that fatally struck a woman in Tempe, Ariz., this month. Uber Technologies has reached a settlement with the family of the woman killed earlier this month in Tempe, Ariz., after one of the company's self-driving test vehicles struck her as she was crossing a street. Member station KJZZ in Tempe reports that an attorney for the victim's family, Christina Perez Hesano, confirmed the settlement Wednesday night but provided few details. "The matter has been resolved," Hesano said, adding that the settlement was between Uber and the daughter and husband of Elaine Herzberg, 49. The names of Herzberg's daughter and husband were not disclosed and the attorney said there would be no further comment. Herzberg was seen in a dashcam video released last week from the self-driving SUV that hit her. It shows her walking a bicycle across a darkened road moments before the fatal impact. Her death is believed to be the first involving a pedestrian struck by a self-driving vehicle. An internal camera in the Uber test vehicle showed the human safety driver mostly looking down and not at the road in the moments before the crash. KJZZ's Jimmy Jenkins says that earlier this week Arizona Gov. Doug Ducey instructed the Department of Transportation to suspend Uber's ability to test driverless cars on public roadways in Arizona. Uber says it has halted testing while it works with the police and federal officials to learn more about the crash. The National Transportation Safety Board says its investigation will take 12 to 14 months.